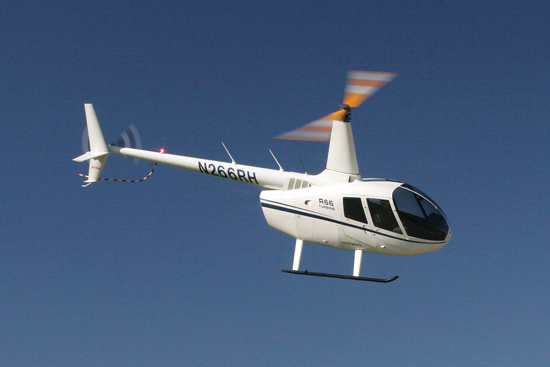 It is with great anticipation that we now offer the new Robinson R66 turbine Helicopter. The new five-seat Robinson R66 turbine encompasses many of the Robinson R44 features. The customary two-bladed rotor, T-bar cyclic and open interior cabin configuration, to name a few, are the features that have made the R44 such a huge success. Some new features include vastly increased reserve power, increased altitude performance and the new 5th seat. With the additional power advantage, increased luggage capacity was also incorporated. Leather seats, HID landing lights and a stereo audio control panel are standard in the Robinson R66. With these additional features, we think there are exciting times ahead in the turbine sector. The Robinson R66 turbine has not compromised price, but will revolutionise the turbine market.